Vreni Schneider is widely seen as the most technically accomplished female Alpine skier in the history of the sport and her wonderful record reveals a dominance of the circuit that has rarely been matched. By the time she finally left the circuit in 1995, the Swiss had notched up 55 world cup victories, only seven less than the great Austrian, Annemarie Moser-Proll. From the moment she won her first major race at Santa Caterina in 1985 to her retirement ten years later she showed total mastery of the technical races, winning 34 slaloms and 20 giant slaloms plus 1 combined. Schneider's mother died when she was 15, obliging her to take charge of the lion's share of the household chores while her father was at work. The experience, although unwelcome at the time, gave her a tough streak that was to serve her well later on. 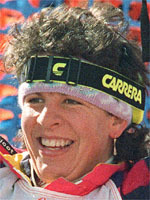 Once Schneider had cracked her first giant slalom title in 1986, she was virtually unbeatable. She won three overall titles throughout her career, 1989, 1994 and 1995, three world championship gold medals, four giant slalom crowns and six slalom titles, as well as three Olympic gold medals. Victory at Olympic level was only a matter of time and the breakthrough came at her first attempt when she achieved a rare feat at Calgary in 1988 by winning the giant slalom and slalom gold medals. The feat had only ever been managed twice before, by American Andrea Mead Lawrence in 1952, and by Hanni Wenzel of Liechtenstein in 1980. Forced to drop out of the 1992 Albertville Games because of a painful back injury, Schneider had more luck at Lillehammer two years later where she won the slalom, took silver in the combined race and bronze in the giant slalom. Arguably her greatest season was in 1988-89 when, almost incredibly, she won 14 world cup races, including all seven slalom titles, breaking Swedish superstar Ingemar Stenmark's record. Less glamorous than Maria Walliser, not as sparkling as Michela Figini, the modest and shy Schneider was nevertheless extremely popular with winter sports fans and professional skiers alike. The Swiss is not only a nice person but also a skier of exceptional talent and strength who got the best out of the piste using men's, rather than women's skis. Since her retirement aged 30 in 1995, following her third World Cup title, Schneider has been running a ski school in her home town of Elm.